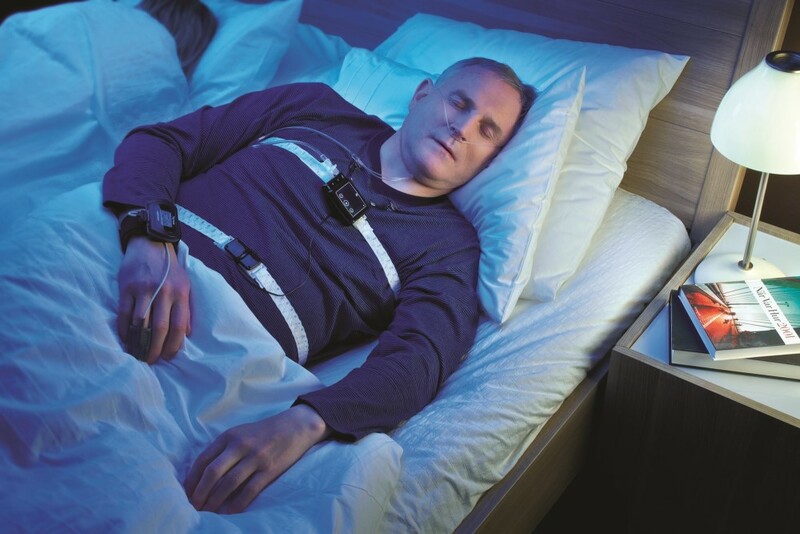 A sleep study, otherwise known as a polysomnography test is a device that monitors your sleep at night. Most sleep studies are performed to diagnose obstructive sleep apnoea, and occasionally Upper Airways Resistance Syndrome. Sometimes they can be used to diagnose other diseases such as Restless Legs Syndrome, or Epilepsy. Sleep Studies are performed over one night and can be either performed at home or in a hospital. Normally if you are worried about Obstructive Sleep Apnoea or Upper Airways Resistance Syndrome, then a study performed at home is all you need. If your doctor suggests that you need a sleep study done in a hospital overnight, then they will be also checking for epilepsy (as they will require a video recording of the sleeping patient). Restless legs syndrome can be diagnosed at home, and does not require an inpatient stay, but often a video recording is very useful. A Sleep Study done in a hospital is often called a Polysomnography. There is a monitor that sits on your finger which monitors pulse rate and oxygen levels in your blood. The elastic straps that go around your chest are there to monitor how hard you are trying to breathe at night. The one around your stomach is compared to the one around your chest, and that provides information about people who are struggling to breathe at night (the chest and stomach move in different directions when someone is trying to breathe against a blockage). There is sometimes a cable that runs around your nose and monitors the airflow at whilst you breathe. This is very important when you are trying to diagnose Upper Airways Resistance Syndrome. There can be a number of other cables that lead to you head or legs to diagnose other conditions. There is a similar set up for children as seen in the image below. Pulse oximetry is just the device that sits on your finger at night (monitoring heart rate and oxygen levels in the blood. Mr Vik Veer does not recommend the use of these devices as they are unable to detect most problems during sleep. It will only pick up very obvious severe sleep apnoea but in Mr Vik Veer’s experience it misses significant problems with sleep disordered breathing. Mr Vik Veer has met a number of people who have had a pulse oximetry test (which is mainly used by Respiratory teams who provide CPAP), who were then told that they have no problem after the test. When they go on to have a proper sleep study they find out that in fact they have a treatable sleep disorder which helps them with their tiredness and other symptoms. If you know you will only accept CPAP as a treatment option, then a pulse oximetry would be a reasonable choice. Pulse Oximetry is often used for children in the NHS to work out if they should undergo an adenotonsillectomy to solve their sleep apnoea problem. Mr Vik Veer still advocates a proper sleep study even in children. How can I get a Sleep Study done? Mr Vik Veer provides a courier service where a state-of-the-art sleep study machine is sent directly to your home / workplace. You would then use the device that night in the comfort of your own bed, and then the courier will return the next day to pick up the device. This avoids having to travel into central London to pick up a device and return it by hand the next day. Because of the courier, this sleep study option is now a national service. Now anyone in the country is able to have a sleep study done whenever they wish. To get the results you may want to have a formal report written for you by Mr Vik Veer or if you prefer you can visit Mr Vik Veer in his London clinics to discuss the results face-to-face. Which Sleep Study does Mr Vik Veer use? Mr Vik Veer uses the best home sleep study device on the market. 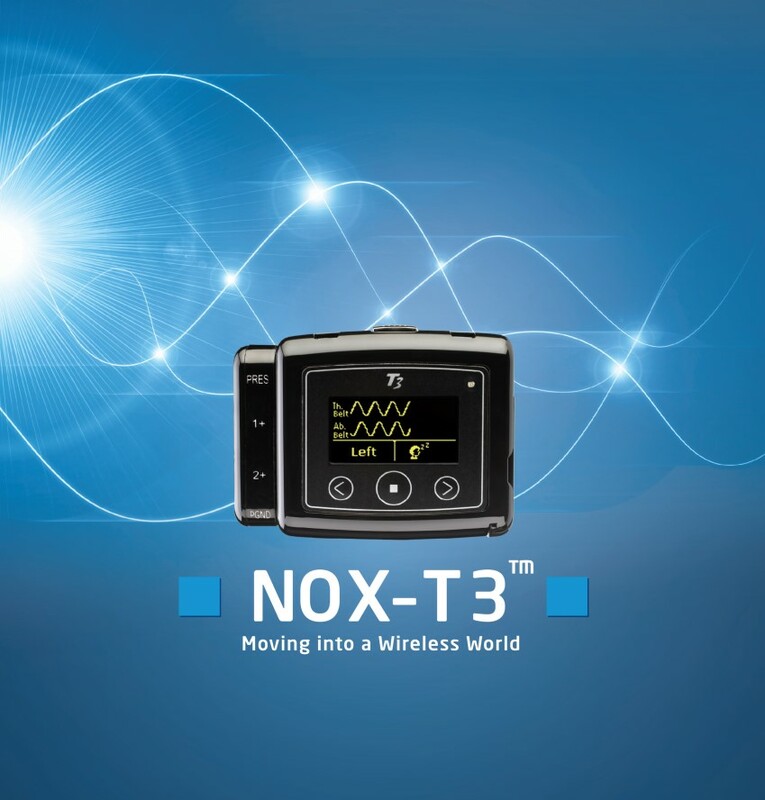 The NoxT3 is the same reference device used by the best Sleep centres around the world including the centres of excellence in London - Royal National Throat Nose and Ear Hospital in Kings Cross, and the Royal Brompton Hospital, Chelesea. 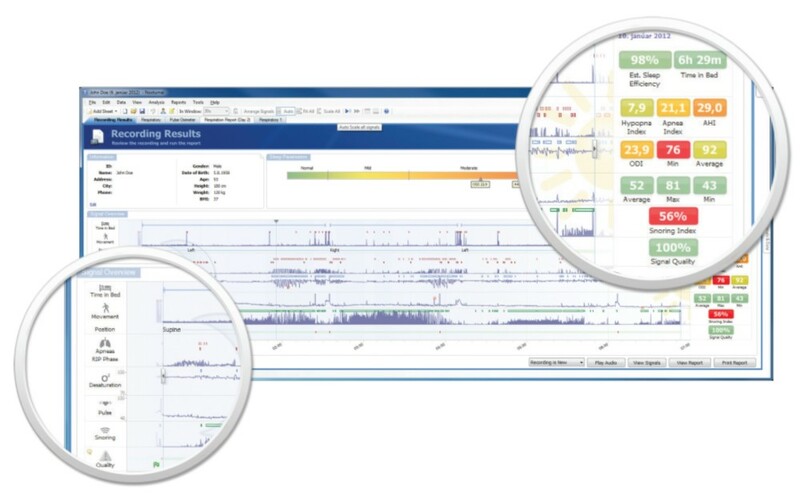 The NoxT3 sleep study provides a wealth of information for analysis. 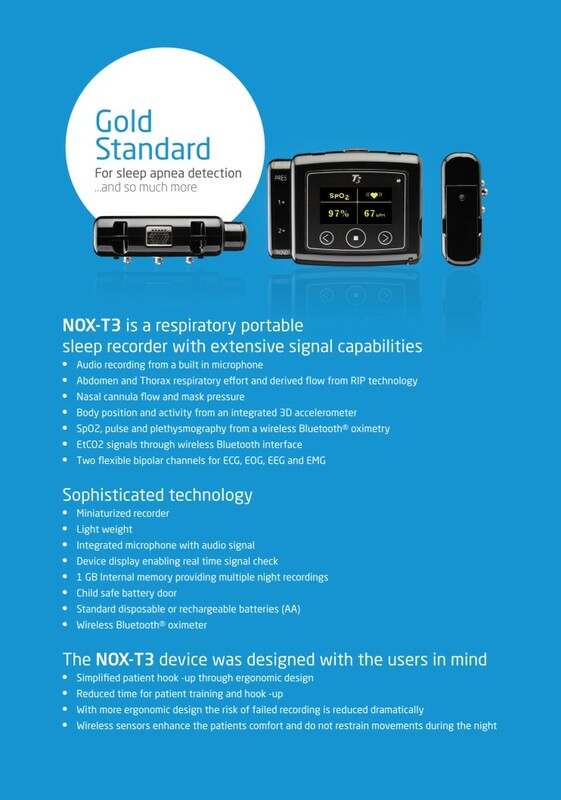 Not only does it provide accurate information about the number of times someone stops breathing at night (AHI), but it also provides an ODI result (the number of times the patient stops breathing and if it causes a loss of oxygen in the blood). Importantly for Upper Airways Resistance Syndrome the NoxT3 also measures the airflow and how it is being resistricted. It also measures how much effort the patient is making to try and breathe. People who work hard to breathe all night often do rather well on less advanced sleep studies, but when you look at the effort they are making to breathe, it is no wonder why these people are so tired in the morning. Fighting to breathe all night is extremely tiring, and this aspect is often missed in other sleep studies. Oxygen levels, heart rate anomalies, and if necessary information about snoring, brain activity, leg movements, and even bruxism (grinding teeth whilst sleeping. All of these measurements are supported by positional information which provide a great depth of information. You can therefore see which side you need to sleep on to snore less or breathe better. Sometimes patients are classified as having severe obstructive sleep apnoea and are given a CPAP machine to treat it. However if you look at the positional data, often these patients just need to be trained to sleep on their side at night to completely resolve their obstructive sleep apnoea (OSA). Another way of trying to find out if you have Sleep Apnoea is to use the STOPBANG Questionnaire, A Simplified version is provided below. T – Are you tired during the day? O – Has anyone observed you stop breathing at night? B – Is your Body Mass Index (BMI) greater than 35? A – Are you older than 50? N – Is your shirt collar size greater than 17 inches (16 inches for a woman)? G – Are you male? If you score 2 or less you are low risk. If you score 3 to 4 you are intermediate risk. Greater than 4 you are high risk for having sleep apnoea. If you score 2 in any of the 'STOP' questions AND if you are male OR have a wide neck OR have a BMI greater than 35, then you actually have a high risk. Mr Vik Veer is developing a new way of assessing if you have Obstructive Sleep Apnoea, which is called the STAMP Questionnaire. This provides a score out of 100, with the higher scores meaning you have a higher chance of that you are suffering from symptoms that you get in Obstructive Sleep Apnoea. This questionnaire is still in the research phase of development. The current only true way of working out if you have obstructive sleep apnoea, is to undergo a Sleep Study otherwise known as a Polysomnogram. This is basically a test which monitors you whilst you sleep and works out if you have obstructive sleep apnoea or not. The test at its most simplest will give an AHI result. This is the number of times you stop breathing on average for every hour you sleep. An AHI below 5 is considered normal in adults. Unfortunately the overall AHI score can be misleading as it might be that patients only get obstructive apnoeas when lying on their back. If on the night of the sleep study you happened to mainly sleep on your side this would mean the total average AHI for the whole night would dip below 5 giving the false impression that they are normal. A close examination of the entire sleep study is required to make sure that nothing is missed. Mr Vik Veer provides a sleep study service where the device couriered direcly to you. If you are thinking of seeing Mr Vik Veer for a private consultation, it would speed up the process if you bring your full sleep study report with you to the appointment. Please note that for adults a pulse oximetry monitor does not provide adequate enough information. Either a full polysomnogram or a good quality home sleep study is required. Mr Vik Veer prefers the NoxT3 Sleep Study device if possible. For children, a sleep study is not always necessary.